A fellow blogger, Maia from “BoundforAdventure” , is currently staying in Stuttgart, Germany and asked for some tipps for good skiing or snow boarding. I thought about it for some time and then came up with this list … I added the approx. driving time (as stated by ViaMichelin) from Stuttgart, to give some idea about the distances. I only included Skiing resorts I have visited … some big ones of Tyrol (e.g. Zillertal, Sölden) or Switzerland are missing – although they are in reachable (up to 4 hours drive) distance from Stuttgart. Other ones – especially in Salzburg and eastwards have been excluded as they are too far away. Kitzbühel – one of the most prestigious skiing resorts in the Alpes. Some really great runs – it is not too high up the mountains, therefore it is not really a Spring destination. Rather expensive, but that is part of the deal. In the same valley there is also the “Skiwelt Wilder Kaiser” – which offers a huge area and is connected to a lot of villages in the region – so you can get great money for value. Ischgl – famous for wild parties, this skiing resort has a much more to offer. With lifts up to 2872 Meters it is ideal for spring skiing and it is also connected to Samnaun in Switzerland: you actually ski in Austria AND Switzerland. The runs are great – once you have left the partying crowds at the Idalp you have plenty of options for great skiing and boarding. Most people from the skiing resort I worked in, went there to ski after the season was over … that’s a real recommendation! If you want to avoid noisy Ischgl – stay in Galtür (the next village), but ski in Ischgl … it is great skiing. St. Anton am Arlberg – the cradle of skiing at the Arlberg: this is a hot spot for free-skiers and snow boarders who look for off-piste fun. It is also a hotspot to meet fellow english-speaking people: Good runs, great off-piste and a lot of party are guaranteed at St. Anton. Zürs-Lech – the Vorarlberg part of the Arlberg skiing region is another hot spot for VIPs and the super rich. But it is also a fantastic skiing resort. Great pistes are guaranteed and going out might be a tad expensive, but it is also great fun. Here is the only place in Austria, where you can go Heli-Skiing. Moreover this year you might encounter Anthony Gourmleys “Horizon Field” – a art project on exactly 2.039 m above sea level. Sonnenkopf – this is a insider tipp for off-piste fans. Located in the Klostertal, this small resorts belong to the Bergbahnen St. Anton am Arlberg. The resort has now artificial snow at all, but they do not need it. They are blessed with loads of snow and a real power paradise. As only few people consider this resort, you might even get some “fresh” powder action, when the powder has vanished everywhere else. 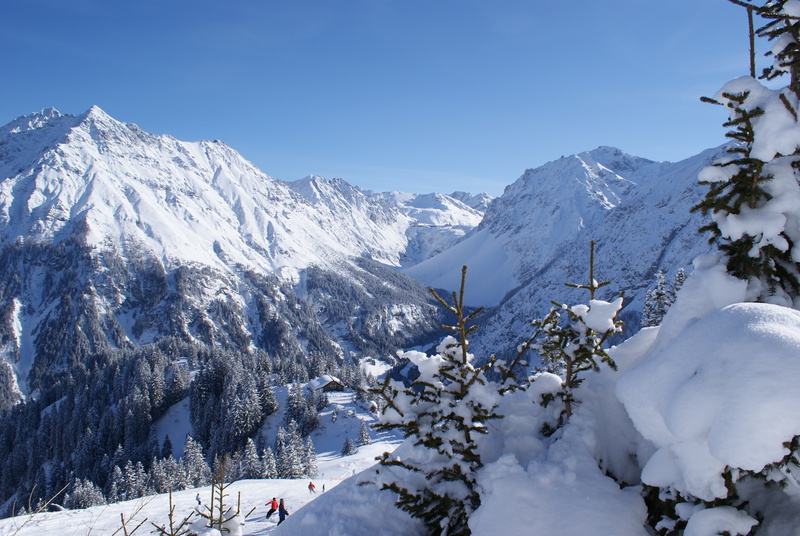 Montafon – this valley offers a lot of different skiing resorts. From the huge “Silvretta-Montafon”, over powder and spring skiing paradise Gargellen to the Golm, which is a nice family skiing resort … Great skiing, good party and good money for value.